Utrecht is getting more and more international attention as a city where interesting things with respect to urban transportation are taking place. I have already written a lot of posts about some of the visible results of the overarching mobility plan. The city of Utrecht now published a video to inform the residents about that mobility plan and the transport policies. The city has also been kind enough to subtitle a version of the video in English. A perfect video to show you in this “no-post” week. This used to be a signalised intersection with long waiting times for cycling. Now it is an experimental type of intersection where traffic flows a lot smoother. Waiting times for cycling have especially been reduced. See the post for more information. Utrecht is the fastest growing city of the Netherlands. By 2030 it will have more than 400,000 residents (compared to 344,000 in 2017), but the available space remains the same. This means that more people will make more journeys in the same space. Unless something changes in the transportation system, this is not possible without causing problems. public transport must be improved and its use stimulated. 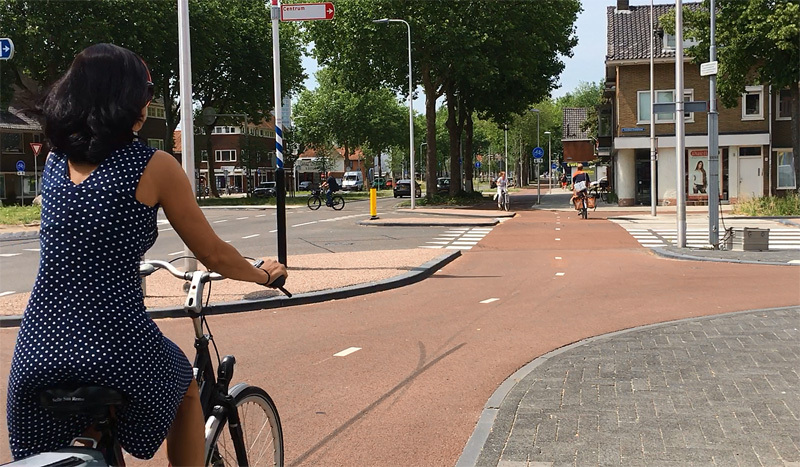 Crossing the ‘t Goylaan in Utrecht has become much easier since the road was changed from 2×2 lanes for motor traffic to 2×1 lane. The wide median now has a double row of newly planted trees that weren’t even there yet when I published my post about this transformed street. 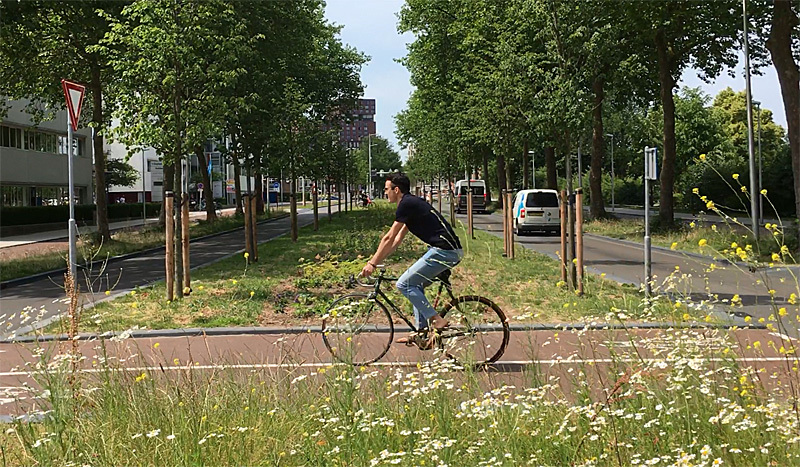 The adopted policy is called “Utrecht attractive and accessible” and it dictates that transport must be cleaner, quieter, and more efficient. Everyone can make a difference by walking and cycling more often and by traveling outside peak hours. The city will play its part for instance by introducing electric buses and making it possible that parcel deliveries can be done by (cargo) bicycle. In the city’s video, the policies are explained and some entrepreneurs and residents tell you how they were involved and what they think. 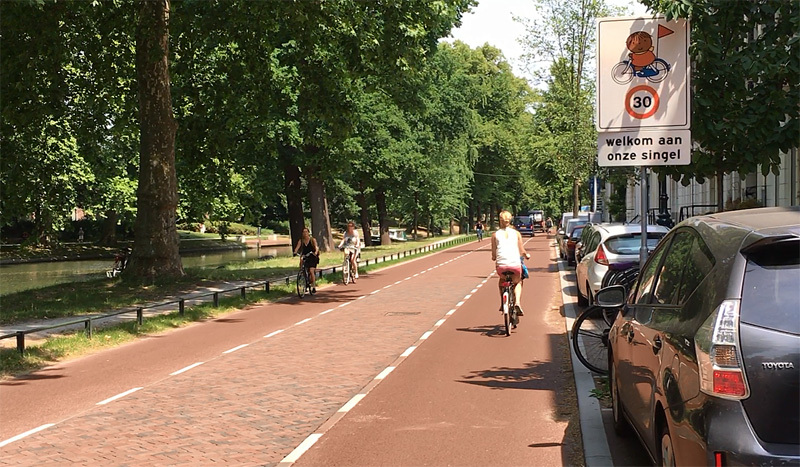 In many previous posts, I’ve already stated that Utrecht is really making differences in the streets. Do these policies have any other results that you can measure? Apparently so. About two weeks ago a national newspaper reported that the air over Utrecht became a bit cleaner between 2010 and 2015. The CO2 emissions dropped with 8 percent. This was even before the introduction of a low-emission zone in 2015, that prohibits diesel powered vehicles -built before 2001- to enter a large part of the city centre. Car ownership decreased a bit in Utrecht and more businesses and households placed solar panels on the roofs. Because so many measures were taken, “independent researcher TNO, cannot single out the transport policy as the or a reason for the change”, said alderman for traffic and the environment Lot van Hooijdonk, “monitoring CO2 emissions in the future will have to make clear whether the effect is temporary or lasting” states the TNO report. The Utrecht Tolsteegsingel and Maliesingel once were main streets. But no longer, they have been transformed into cyclestreets with just a bit of space for bi-drectional motor traffic in between the wide on-street cycle lanes. It seems Utrecht is on the right track though, to become the “climate neutral” city it wants to be in 2030. When it comes to more transport with cargo bikes there was another interesting video published this week, about the International Cargo Bike Festival (that I sadly missed this year) that was held in Nijmegen from 11-13 June last. How is the push for automated electric vehicles forecasted to impact the bicycle delivery business in The Netherlands? After all, it is the human component that is the least reliable and most costly component of the system. I doubt that. In the Netherlands, ‘Bicycle delivery’ exists only in reasonable numbers for two kind of services: bicycle couriers, and the newer bicycle food delivery. Both of them would be very hard to replace with an autonomous vehicle, since for both, the actual travel time is not the largest amount of time and effort spent. Actual pickup (either at reception desk of an office or at the kitchen of a restaurant) and delivery (at reception desk or front door) is typically taking more time for these short-distance deliveries. As long as automated vehicles don’t read elevator signs, don’t talk to the receptionist and aren’t able to pick up and handle food themselves, I don’t see how they would replace these services? To elaborate on that: I think that autonomous vehicles will be most useful for longer-distance low interaction types of transportation. First trucks, then taxi’s and cars over longer distances, long before shorter delivery routes. Bicycles will be the last in the chain to be replaced. The more handling is required, the less autonomous these vehicles will prove themselves, at least for the foreseeable future. Drivers can travel the shortest distance between the ring road and their destination in the city center. I feel like this recognition that people will still drive is something missing from transportation discussions in the Washington, DC area. It’s very much a pedestrian vs. cyclist vs. driver vs. transit fight that has resulted in more motor traffic congestion rather than making walking, cycling, and transit safer or more attractive. Changing the way people move around in Los Angeles is a very slow process, its like trying to get a big ship to move in a different direction. One problem that is going to occur is that after narrowing the number of motor vehicle lanes there can be a lot of push back from irate motorists, as illustrated by the recent narrowing of a street in the LA community of Playa del Rey. Hey Mark, great videos, thanks for posting. Big up to all the planners involved in Utrecht’s current and future success. Also to all involved in the cargo bike industry. I fail to see how all these ideas won’t eventually make it Down Under. This entry was posted on 27 June 2017 by Bicycle Dutch in Original posts and tagged cargo bike festival, Nijmegen, policies, urban planning, Utrecht.